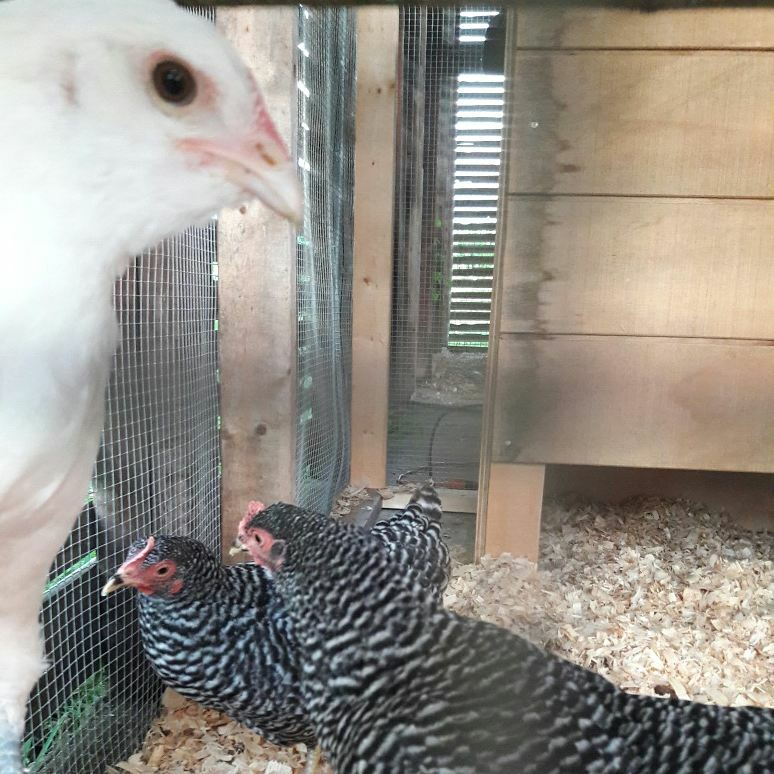 Bobbi Buller: Three new Girls! 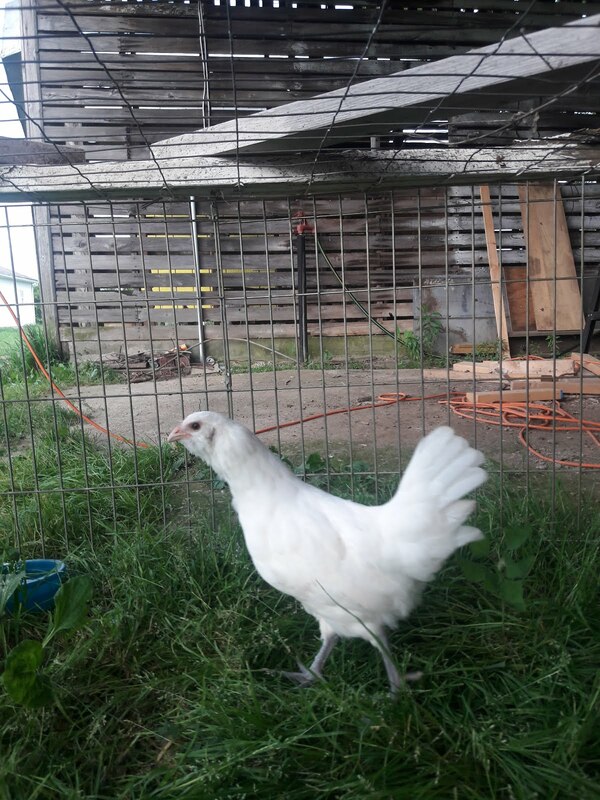 We picked up three new pullets to add to the flock from the Ionia County Fair. 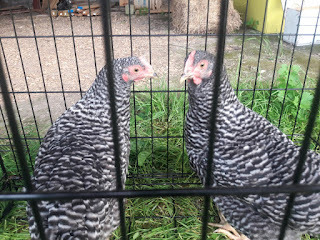 We got them on the 22nd and put them in Joe's pen to keep them somewhat quarantined from the rest of the chickens. The two Plymouth Barred Rocks were picking on the smaller Ameraucana so during the day I put her in her own pen in the grass. The Plymouth breed is known for being a bit bossy! Those two remind me of the twin sisters of Marge on the Simpson show, so we named them Selma and Patty! Jim named the white one Priscilla. She was very sweet and would fall asleep on my lap! Unfortunately by the next weekend she was not doing so good. I noticed Saturday night (29th) she was sleeping on the ground instead of on top of the feeder or roost. I let her be thinking she was just trying to stay away from the bossy girls. Sunday morning she was in the same exact spot an position, head tucked behind her wing. She didn't stir until I started going into the coop. I moved her to her own spot again but all day she sat in one spot and did not move or eat or drink. Towards the end of the day I moved her into the house and forced some homemade electrolytes into her. But she continued to decline, she soon lost the ability to sit up and was laying on her side. 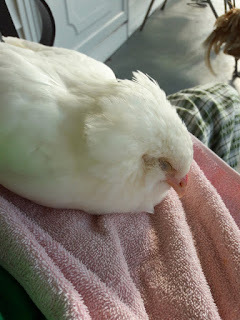 We took her to the vet on Monday late afternoon. She had a neurological virus that was not curable but also very contagious. Now some birds can get it and recover but the vet didn't think Priscilla's chances were very good because she was so thin. She did pass during that evening. I was very sad that she died, she was such a sweet girl. Now I pray that no one else gets sick!